Learning how to play guitar has been the goal for many up-and-coming musicians. Many of us have gazed into the music store window or have even watched others playing, only wishing we could effortlessly wow the audience alongside them. How many of us when hearing our favorite song on the radio, breakout 'air guitar' and begin "shredding" along note for note? Wouldn't it be nice to know where to start when first learning to play guitar? The guitar is a very popular due to its versatility and ease of transport. It's one of those standalone instruments, that anyone can play another instrument or sing along with almost anywhere. Guitars are great accompanying instruments for singers and they provide the rhythm and provide enough background sound to fill the space quite nicely to carry the tune. There are so many styles of music when learning to play the guitar such as country, rock, jazz, classical, and much more. So, what does it take to learn guitar and how long will it require to play proficiently? What should you look for when buying a guitar? How do you choose the right one for you? 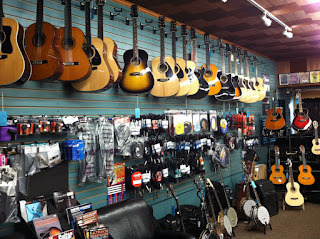 Selecting the right guitar will depend much on your musical needs and whether you choose to play indoors or outdoors. The most versatile of all guitars are acoustic guitars, which means they do not require electricity or an amplifier in order to be heard. Getting that heavy-loud rock sound will require more juice, in which case you want an electric guitar with all its effects. Spanish guitars also are known as classical guitars. Generally, come with nylon strings and tend to lack of bright and powerful sound of music genres like pop-rock. Flattop guitars are strong with steel strings and are great for vigorous strumming with a pick or intricate solo. The preferred choice of country, folk, indie, or rock depending on how is played. Electric guitars come with metal strings and are fitted with electromagnetic pickups in order to amplify it sound. The signal from the pickups to the air can be fed through effects circuitry which creates an endless variety of sounds. Better for playing Blues, Metal, and Classic Rock. When selecting between an acoustic guitar as opposed to an electric guitar you might consider such factors as your musical preferences and practical requirements. One advantage a flattop guitar has over an electric is that there is no real time setting up other than taking the guitar out of the case and maybe tuning it. Good to go. Standard flattops are larger, however, ranging from a parlor style model to the broad-shouldered dreadnoughts and jumbos mostly played by country and folk type singers and musicians. 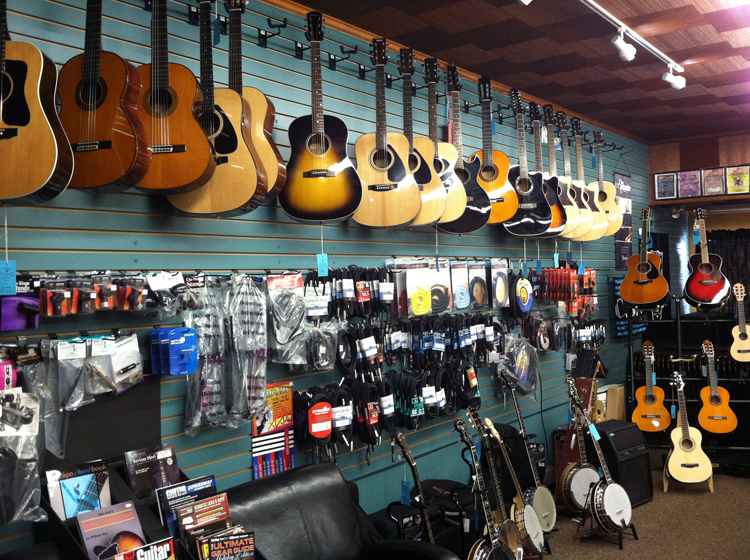 Acoustic guitars can easily fill a room with a vibrant rich sound all on their own. In some cases, you can also purchase acoustic electric in which there are pickups built into the acoustic giving you both options to choose from. little higher and tougher in some cases depending on the gauge of the strings. Electric guitars offer a large spectrum of sounds depending on the guitar, amplification, and effects pedals that are being used. Built in whammy bar and lower action for easier soloing. The overdrive pedal or switch can give you that heavy and squealing rock sound so many enjoy. Cheap isn't always better. There are many places person to buy a guitar. it seems that going to the music store is no longer necessary. You can even buy a guitar at Best Buy these days. But, let's face it, going to a music store and speaking to a staff member who will very likely be a guitar player themselves is a good first option. From there it's entirely up to you to either purchase something new or doing a little research, then get looking into the "previously enjoyed" category called second-hand like on Kijiji or Craigslist. Go to a music store. Even if you decide to purchase a second and guitar or order one online, it pays to go to a music store ahead of time. You'll want to gain as much knowledge as you can from someone who is experienced. Take the time to listen carefully but also, listen to your gut instinct at the same time. Ask the salesperson to demonstrate by playing single-dose off chords at various pitches and finger positions. Do you like the sound of it? What don't you like about it? Try it out for yourself. If you're not sure how to hold our someone for help. from the strings from top to bottom and listens all six notes only. Take note of any rattles or buzzes. Look over the body. Check for cracks bad scratches or other damage. Make sure to play it through it an amp when testing of electric guitar and try the various settings. How does it feel? Holding you guitar is very important when playing. You must feel comfortable and not feel like you are laboring as you are trying to get into the zone. so make sure you find a good fit. I just the strap to make sure that the guitar is easy to strum and play chords. Holding the guitar. Sit down in a comfortable chair. One that does not allow you to slouch or that is so narrow that the body of the guitar in your own body would not fit comfortably. Next, assuming that you are a right-handed player, place the body of the guitar on your right thigh. which your left hand on his neck and assess it for comfort and balance. 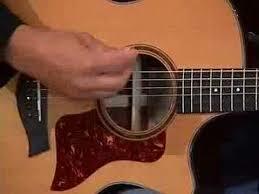 Strum the strings from top to bottom with your right index finger and listen to each individual note. start by holding the pick between your right-hand thumb and index finger. This area over the strings and sweet across them moving downward from the heaviest rain to the lightest thing. Make sure the text is three only allowing it may contact with the strength allowing the notes to rain freely. Now try playing the strings one by one, stopping your pick after each note prevented from making accidental contact with the adjacent strings. From here you should be ready to the guitar. there are many electronic guitar tuners to select from. They range from 20 dollars any wares up to 500 dollars depending on your needs and budget. The neck runs the length of the guitar from the body to the headstock.the neck is where the frets are located. 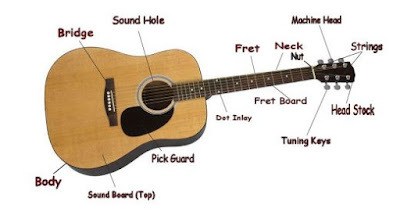 The fretboard and frets are the locators on the guitar in which to place your fingers on the strings. when we apply pressure to the strings in between the frets we create notes. The sound hole, of course, being part of the body allows the air to escape in order to create the sound from an acoustic guitar. note that electric guitars have a plethora plug-in jack for a court to plug into an amplifier. The headstock is the area at the very top of the neck where your tuning keys are located. This is where you tighten the tension or loosen the tension on your strings depending on your tuning. Once your guitar is tuned and you've had a chance to play around with strings a little bit you're probably ready to play your first chord. A chord is a group of notes that make musical sense when there played simultaneously. Basically, it is three different notes played in harmony. Stay relaxed and comfortable to ensure balance while holding the guitar. wrap your left hand around the neck back of the guitar. Slide up and down to get a feel of the neck. 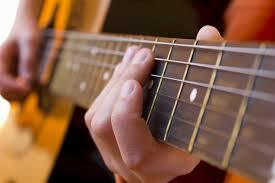 Pressing your fingers in various shapes throughout the fretboard is the key. When you first start out you will probably have your fingers rub against other strings when you're trying to shape the chords. That's perfectly okay, the idea is to shape the chord and play through each individual string until each sounding note is clear and then finally playing them all together it perfect and they have a chord. From here it is a matter of learning to use your other hand while holding a pick to strum the strings to the rhythm of the song. You will probably begin strumming down. but the idea is to learn how to build good rhythm and strum up and down in an even flow to the music. Eventually, you may even learn how to sing. and play guitar at the same time with some practice. Now go get a guitar and start playing! For more information regarding music related articles such as singing tips , please click the link.